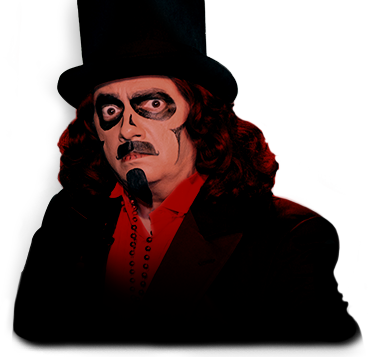 Svengoolie has been the premier horror show icon of Chicago, since multiple Emmy award winner Rich Koz became the hand-picked successor to the original Svengoolie back in the late '70s. He has appeared on a national basis on MeTV since April 2011 - and generations of viewers have become fans of the monstrous mirth and movies that this video vampire dispenses every week over the airwaves. 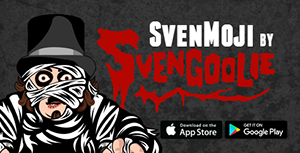 Svengoolie brings you the classic Universal horror films and more, many of which have not been seen on broadcast television in years. Svengoolie has been voted "Favorite Horror Host" multiple times in the national Rondo horror awards - and been acknowledged by even the most famous horror hosts as a peer. Svengoolie reigns as the king of horror hilarity on MeTV! Were you "Son of Svengoolie?" Yes - running on Chicago's WFLD from 1979 to 1986.
Who was the original Svengoolie? Jerry G. Bishop - on WFLD - from 1970 to 1973. He was the one who decided that I should be "Son of Svengoolie" and, when I came to Chicago's WCIU in 1995, decided that I should just be "Svengoolie." What was his theme song? His original theme song (and mine for my first year) was "Rumble" by Link Ray - sweetened with a sound effects track of a woman screaming! What is your current theme song? It's an original tune by Doug Graves, titled "Son's Theme" - the title derived from my days as Son of Svengoolie. What's the deal with "BERWYN?!" When Jerry G. was starting his show, "Rowan and Martin's Laugh-In" and Johnny Carson were making small town jokes about "beautiful downtown Burbank." Also, famous Cleveland horror host Ghoulardi, who was on TV opposite Jerry when he was there in the early '60s, made fun of local suburb Parma. Jerry discovered the little town that had a parade in honor of mushrooms every year, and decided it would be a good target for his jokes. I continue this tradition, and it's all in fun - Berwyn and its people have always been very kind and supportive! Do you now - or did you ever - live in Berwyn? Nope - never. Nor was I a teacher there, did not go to high school there, etc, etc. There have always been multiple rumors about my connection to Berwyn. Most are not true. What's the deal with the rubber chickens? Rubber chickens are an old comedy prop going all the way back to vaudeville days. In those days, when a performer was bombing, it was traditional to pelt him with rotten vegetables! Jerry thought it would be funny for him to be pelted in a like manner every time he did a corny punch line - but, since rotten veggies would be tough to clean off the set - he opted for the rubber chickens. I simply continue the "family" tradition. Do they hurt when they hit you? Did you used to do "The Koz Zone" on Fox 32 in Chicago? Were you also a weekend weatherman there in the early '90s? Yes. Don’t hold that against me. Can I request or suggest a movie for the show? Why do I see the same movies come up on your show? Why don't you ever show (movie name here)? When we get movies, we sign a contract with the distributor - which states when we can show the film, how many times we must show it, etc. We have to follow the rules of that contract in order to offer the films. We've tried to make sure, whenever possible, that movies don't get repeated during a calendar year - meaning 52 different films each year from January through December. Since we are trying to expand our selection of movies, however, some of the new contracts will mean we have to show certain films twice in a year. 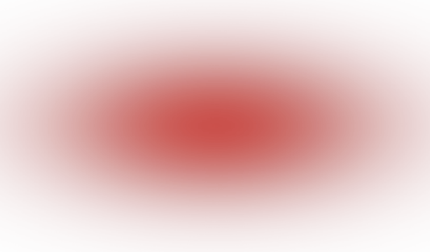 As far as why we don't show (movie name here) - our management tries to get many of the movies you ask about - but many are not available to us - they are under exclusive contract to some other network or cable channel, or, in some cases, no longer even offered to television. Competition - and prices - for movies has gone way up since I first started, with so many new outlets for films. Our fearless leaders do their best to attain new titles for the show. 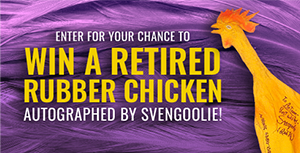 Will Svengoolie make an appearance where I live - if it's outside the Chicago area? We are hoping that this will be possible soon. It depends on a lot of factors, including our work schedule, previously set bookings, etc. All inquiries about appearances should be sent - with full information - to [email protected]. Regardless, we'd love to be able to meet our fans all over the country! Can you send me a rubber chicken? Unfortunately, no - we get far too many requests for that. We also get so many special requests for people who are ill, have birthdays, anniversaries, etc. - and we're sorry that, again, due to all the requests, we cannot possibly fulfill those wishes. If you bring a chicken to any Sven appearance, you can have it signed. That great demand for chickens is why we have the monthly contest, in which ONE random person who has entered will receive a signed chicken. Only one person wins every month, and you do need to re-sign up every month. Enter here! Where can I get a list of this month's movies? All you have to do is sign up for the Sven monthly newsletter (it's free) on our site - and the first of each month, you will get the newsletter with the complete schedule. If you do not get your copy, contact MeTV using the contact form at metv.com. I have a problem with my order of Sven merchandise - who do I contact? Well, certainly not me, Sven - I have nothing to do with orders - I just do the TV shows. Contact the MeTV Store here. Can I order a previous design of Sven t-shirt that came before the current shirt? Unfortunately, no - all previous designs are sold before we offer a new design. If that changes, we'll promote it. I saw a Sven t-shirt offered online that is a different color than the ones in your store - why don't you have that in your store? Because it is unlicensed bootleg merchandise that the seller has no right to be selling - the only licensed Sven merchandise is the stuff you see in our store. If you see any Sven product that isn’t in our store, please let us know, and give full details where you saw it. Our legal team will be happy to get that information. Why didn't you show my photo or drawing? Can you let me know when my photo/drawing will be on the show? We get hundreds of questions, photos and drawings every week - and much more than we can ever show in our brief mail segments. We can't show or respond to everything, but we do see everything that comes in, and enjoy seeing it all. We do not have the staff to contact everyone about when their submission will appear on the show - you just have to watch every week! Can I come watch a taping? Can I be a chicken thrower? No, sorry - our studio facility is not set up for tours or guests. By e-mail - [email protected]. If you want to digitally send a drawing or photo, just send it as an attachment to the e-mail.